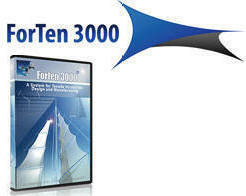 ForTen 3000 is a system for Tensile structure design,analysis and pattern making. Flexible and powerful has gained success and used today in more than 60 companies, Architects & Engineering firms worldwide. Static non-Linear Analysis & mixed Non-Linear /Linear with any number of user defined load cases. Membrane stress plots, Reaction Forces, Supporting Forces & Deformed Shapes can plotted & animated on screen. Patterning Complex double curved shapes has never been so easy. Import/Export to DWG & DXF files of any geometric entity form model pattern to cross section .Import native. Rhinoceros 3dm files with conversions of nurbs surface to tenso groups.